This paper focuses on two aspects of the common gill fungus, Panaeolina foenisecii Maire: (1) biochemical, concerning its suspected psychoactive properties; and (2) ethnomycological, regarding several reports of accidental or deliberate consumption of the species. After reviewing the existing literature describing the suspected psychoactive and/or physiological properties of Panaeolina foenisecii Maire, and its alleged production of psilocybin and/or psilocin, the authors of this paper decided to investigate three medical case histories (from Australia, Great Britain and America) involving human ingestion of this fungi. These incidents of mushroom consumption have apparently caused some alarm among mycophagists, mycologists, physicians, and parents of infant children who have purposefully or accidentally eaten P. foenisecii (for a more detailed review on the human ingestion of psilocybian fungi in Australia and New Zealand, see Allen, Merlin & Jansen 1991). Panaeolina foenisecii is a very common, cosmopolitan species (see Fig. 1). Appearing scattered or gregarious on lawns, grassy areas, and in meadows, the mushrooms are frequently observed in the early morning, sometimes wilted or gone by midday. It often is seen in close proximity with other fungus (such as Marasmius oreades (Bolt.:Fr.) Fr., Coprinus spp., Psathyrella spp., and Conocybe spp.) adapted to similar environments (e.g., lawns and grasslands). Over the past 75 years, P. foenisecii has been placed in various genera, including Psilocybe (Ricken 1915), Coprinus (Michael 1919) and Psathyrella (Smith 1972). Taxonomic reference to the genus and synonyms for the species include the following binomials listed according to their chronological taxonomic description. Panaeolina R. Maire, Treb. Mus. Nat. Barcel. ser. Bot. 15:109 (1933). Type species: Agaricus foenisecii Pers. :Fr., Syst. Mycol. 1:295 (1821). Typonym: Psilocybe Fayod, Ann. Sci. Nat. (Bot.) 7(9):377 (1889). Panaeolina foenisecii (Pers.:Fr.) R. Maire (Haymakers). 1. Agaricus foenisecii Pers. :Fr., Syst. Mycol. 1:295 (1821). 2. Psilocybe foenisecii (Pers.:Fr.) Quelet, Champ. Jura. Vosges 1:47 (1872). 3. Drosophila foenisecii (Pers.:Fr.) Quelet, Enchiridion:117 (1886). 4. Psathyra foenisecii (Pers.:Fr.) Bert, Bull. Soc. Mycol. Fr. 17:227 (1901). 5. Panaeolus foenisecii (Pers.:Fr.) Kuhner. Botaniste 17:187 (1926). 6. Panaeolina foenisecii (Pers.:Fr.) R. Maire, Treb. Mus. Cienc. Nat. Barcel. ser. Bot. 15:109 (1933). 7. Psathyrella foenisecii (Pers.:Fr.) A. H. Smith, Mem. NY Bot. Gdn. 24:32 (1972). Description of the cap, gills, stipe, and spores are presented below (see Fig. 1a). CAP: 10-3.5mm. Broad, narrowly conic to convex, bell-shaped with age, dry without hair, margin incurved when young, faintly striate when moist, dull cinnamon brown to reddish brown, sometimes zonate, becoming pallid and sometimes pitted and wrinkled. Flesh grayish white; taste distinctive. GILLS: Ascending-adnate, subdistant, unequal, broad, ventricose, mottled with age. Edges even, white. STIPE: 4-10cm. long. 1.5-3mm. thick, stiff hollow, nearly equal and slightly enlarged at base. Brittle and striate, with minute hairs at apex, smooth or grooved below. Whitish to pinkish brown. Annulus and universal veil absent. SPORES: 11-18 6-9µm in size, dark vinaceous brown to dark purple brown, thick-walled, broadly elliptical, ornamental with spoty warts, pore at apex. The three case histories of suspected ingestion of this species and a chronological review of the chemical analysis of P. foenisecii Maire (including a recent study carried out in Switzerland) are addressed critically in the discussion that follows. 1. Holden (1965) was the first to publish a report on a Panaeolina foenisecii poisoning of a young child (in England). Holden reported the following: "One evening last July (1965) I was phoned by the St. Albans police and asked if I would go to the city hospital to identify some fungi. A boy age three had eaten some toadstools that were growing on the lawn and was very ill with a high temperature, rapid pulse and dilated pupils though without any gastric symptoms. When I arrived at the hospital some very battered specimens were produced but these could be identified with reasonable confidence as Panaeolina foenisecii." Holden also noted that "There is no certainty that the boys illness was actually caused by eating toadstools." Furthermore Holden reported that "The child was too young for any information about hallucinations to be obtained and the case must therefore remain not proven." In the spring of 1990, the senior author (JWA) contacted Margaret Holden, a mycologist. Holden offered the following information: "There is very little I can add about the 3-year-old boy who ate Panaeolina foenisecii at St Albans in 1965. I did not see the child and the symptoms given in my note (News Bulletin of the BMS, no. 25) were described by the doctor in charge of the case. The mother had seen the boy eating toadstools that were growing on the lawn. After taking the child to the hospital she returned home to gather up the remaining specimens, which were given to me to identify. They were all of P. foenisecii but of course there could have been other species there on the lawn such as Psilocybe semilanceata (this is common around here [St Albans] in some seasons). About a week later I received a letter from the doctor thanking me for my help and telling me that the boy had completely recovered" (Holden, 1990, Pers. Comm.). 2. In 1966, Miller (1972), was informed that a four year old American boy (location in the U.S. unknown) was rendered comatose from ingesting Panaeolina foenisecii Maire. Miller's report provided no other information regarding this alleged incident. In January 1991, the authors contacted Miller of the (Department of Biology at Virginia Polytechnic Institute and State University). Miller provided the following information: "The four year old child incident occurred in 1966 in June the night before my family and I left for the Western United States. Dr. Paul Lenz a mycologist at the National Fungus Collection, now retired, called me at my home. He was not a specialist in the Agaricales and had been contacted at the Washington Children's Hospital. He was at his laboratory and had the fungus in hand. His description led me to the conclusion that it was Panaeolina foenisecii. I asked him to check the microscopic characteristics which he did to confirm my identification. He told me that the four year old boy had grazed on an unknown number of fruiting bodies. At the time that he arrived at the hospital he was comatose and his mother was really upset. However, the boy revived soon and the parents were told to keep him awake and watch him for a while. As I heard later they had no trouble keeping him awake, in fact he was super charged for the next 12 hours until the mild hallucinogen wore off!!! Of course, at the time  no one had extracted the psilocybin from it [Panaeolina foenisecii] so we could only speculate that it did have the toxin in it" (Miller 1991, Pers. Comm.). Although numerous mycologists had previously labeled Panaeolina foenisecii as edible, but not recommended for human consumption (Kreigger 1936; Bigalow 1974; Arora 1979; Dickenson & Lukas 1983; McKnight and Knight 1987), the following case history by Southcott (1974) apparently led many mycologists to label Panaeolina foenisecii as poisonous and/or hallucinogenic, and therefore a threat to children who might be more apt to accidentally consume this species (Miller 1972; Stevens & Gee 1977; Kibby 1979; Glick 1979; Cooper 1980; Smith & Weber 1980; Pacioni 1981; Courtenany & Burdsall 1982; Bassette & Sundberg 1987; Mckinny & Stuntz 1987). 3. The case that Southcott (1974) reported occurred in Campbelltown, a suburb of Australia. It concerns a young girl born on December 10, 1969. She is described as being lively spirited, with an ongoing allergic condition. Her mental distress symptoms may have resulted from the fact that she indulged in pica (one who eats dirt, grass, leaves and twigs). According to Southcott "...for some months [the young girl] had been known to have repeated episodes of hallucinations, and each attack was marked by her person being cold and clammy, with frequent bed urination. Her attacks would usually commence about six to eight hours after being allowed to play outdoors around her home, on the lawns and in the garden. In October of 1973, the mother stated that during the previous twelve months her daughter had at least a dozen such attacks, which were very frightening and distressing to the child. Symptoms reported included: seeing colored lights on the ceiling, hallucinating cats that were not there, and feeling that she was bigger than she really was (macrosomatic delusion). An Attack usually lasted no more than four hours. Clinical records from the Adelaide Children's Hospital report the first attack as occurring when the child was about two years eight months old. On the morning of Monday, August 14, 1972, the child awoke and was absolutely terrified and somewhat delirious. She thought that unknown things were biting her, and she reported seeing insects, spiders, and small animals such as cats, dogs, and horses in her bed. Her body was cold and clammy. She had no fever. Her parents brought her into their bedroom and administered some Panadol and she became very twitchy and jumpy. She was kept in the house for the next two days and appeared to have recovered. On Tuesday, she remained excitable and jumpy, but ate very well, and voided frequently. Three days after onset she was allowed outside to play with her mother watching her, but a further attack occurred that night. The following morning the child seemed well until around lunch time when, once again after playing in the garden, she became quite hysterical, screaming that things were biting her feet. After a little while, the child seemed to settle down and took a nap, but two more episodes followed before tea time. After playing fore about three-quarters of an hour she asked to go to bed. She checked under her pillow to see if any insects were in her bed. By this time the mother had begun to take notice that these episodes always seem to occur after the child had played in the garden. Doctors asked the mother if the child had access to drugs in the home. The mother answered no. She was also asked to look for any possible toxic agents which may have been used in the garden, where a wide variety of plants grew, including Cotteneaster (with red berries), Duranta (with yellow berries), and a lilly with red seeds. On one occasion the child was observed chewing soursob (Oxalis pescaprae). A month after onset the mother stated that her child was having attacks every three to four nights since, but that they were not nearly as severe as the first attack. On September 19, the child experienced another attack. Medical examinations proved futile in determining the cause of her distress, and nothing neurological was found wrong with her. There were minor psychological problems between her and her mother. By December, the mother had come to the conclusion that the child's distress and discomfort was possibly caused by a species of small common mushrooms which were known to occur in the kikuyu lawn around their home. At the time this species could not be identified in Adelaide. By March of 1973, clinical records reported that the child was still having hallucinatory attacks at least twice a week, except when she was away from home on holidays. During all this time the child continued to have pica, which eventually decreased but was still occurring in April of 1974. At that time the mother noticed that the absence of hallucinatory attacks in the previous three months may have been due to the absence of mushrooms in the garden. Searches around the kikuyu lawn showed the presence of several different species of grass-inhabiting mushrooms. The mother had not observed the daughter eating a fungus during the period when the child was having her symptoms. After the mother asked the child about the mushrooms, the child described them as being `yummie' and `tasty'" (Southcott 1974). Specimens of the fungus allegedly involved in ingestions referred to above were photographed in situ, collected, and then preserved by Southcott who also again photographed them both before and after drying. In 1974, Roy Watling of the Royal Botanical Gardens of Edinburgh, Scotland visited Adelaide and identified Southcott's fungus specimens as Panaeolina foenisecii. Although Southcott believed that the evidence in this case history of fungal intoxication was circumstantial, he stated that "...it appears to be a plausible explanation for the girl's symptoms" (Specimens of P. foenisecii collected by Southcott are on deposit in the herbarium of the botanical garden of North Terrace, Adelaide 5000, South Australia). In the past, as noted above, numerous mycologists had listed this species as edible, but not desirable; while most recent mycological publications refer to this mushroom as poisonous and/or hallucinogenic. 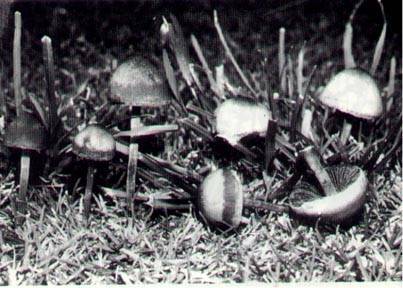 The question of the suspected psychoactive properties of P. foenisecii, which allegedly caused hallucinations in three young children (described above), three teen-agers (Cooles 1980), and two elderly ladies (Allen 1988b), is confused by conflicting observations of mycologists and other investigators who have studied this species. There is some mycological disagreement regarding the natural production and presence of psilocybin and psilocin in Panaeolina foenisecii. 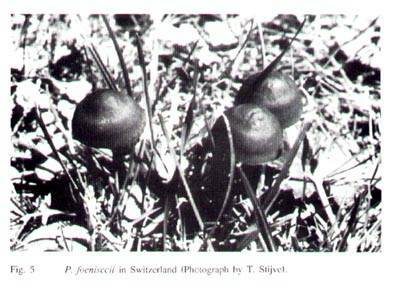 Some have even referred to the suspected appearance of these alkaloids in this species as sporadic (Ola'h 1970). Panaeolina foenisecii was first investigated for the presence of indole compounds by Tyler and Smith (1963). They detected no psilocybin or psilocin in the specimens they analyzed, but did report the occurrence of 5-hydroxytryptamine (serotonin), along with 5-hydroxytryptophan, and 5-hydroxyindoleacetic acid. Two years later, Holden (1965) reported a suspected poisoning in a young English boy who became ill with tachycardia and mydriasis after allegedly consuming Panaeolina foenisecii). Specimens of the fungus collected in England and examined by Holden in 1969, contained no detectable psilocybin or psilocin (Mantle & Waight 1969). Ola'h (1968a; 1968b; 1969; 1970) studied this species and described it as being 'latent psilocybian' (i.e., only producing these compounds sporadically). Robbers et al. 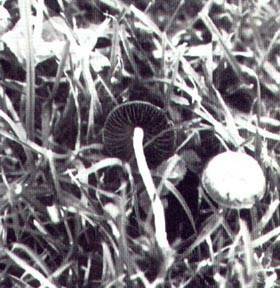 (1969), reported detection of psilocybin in two collections of P. foenisecii, -- one from Lafayette, Indiana, and another from Quebec, Canada. A third collection of the fungus, from Seattle, Washington, did not contain psilocybin. In 1972 Fiusello and Ceruti-Scurti reported analysis of an Italian collection of P. foenisecii and found psilocybin present in one of two samples. Specimens collected during the spring of 1972 in Seattle, Washington tested negative (Enos 1972; Brolyn 1990). Later that same year, Miller (1972) commented on a case of poisoning that occurred earlier in 1966, in which this fungus was eaten by a four year old boy who "...was rendered comatose for a short time." Two years later, Southcott (1974) reported the above cited Australian case. Although much earlier, Cleland (1934) first recorded the presence of the "haymaker's mushroom" in Australia, he identified the fungus as Psilocybe foenisecii (Pers.) Fr. (the Latin name Foenisecia, means "Hay-harvest). Cleland made no mention regarding the species toxicity or edibility. Specimens of P. foenisecii collected near Canberra, Australia were analyzed by R.W. Rickards (cf. Southcott 1974) and were reported as being psilocybin negative. Ott (1976), citing Robbers et al. 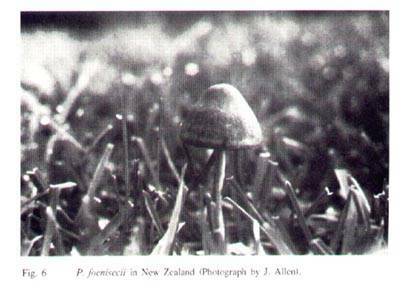 (1969) as his source, noted that P. foenisecii specimens from Ontario and Indiana were tested as psilocybin positive. The specimens referred to above were actually collected in Quebec and Indiana. Ott (1974-1975) later mentioned that he himself ingested a large number of the "haymaker's mushroom collected near Olympia, Washington; he reported no noticeable effects. Pollock (1976) based the following statement on a study by Ola'h (1970) involving five samples of P. foenisecii (four from Quebec and one from Paris); "two from Quebec contained both psilocybin and psilocin, whereas the one from Paris and one of the two other samples from Quebec contained psilocybin." Ott and Guzman (1976) carried out further investigations regarding the production of psilocybin and psilocin in P. foenisecii. They analyzed specimens from the Federal District of Mexico and found them to be void of psilocybin. Ott and Pollock (Guzman et al. 1976) also collected specimens of P. foenisecii from Oregon in 1975. No psilocybin was detected. Haard and Haard (1975) suggested that psilocybin and psilocin are only found in this fungus in the United States on the East Coast; while Menser (1977) noted that "Western analyses have often shown the presence of psilocybin (but not psilocin) in small amounts only" (the authors of the present study found no reference verifying either Menser's or Haard and Haard's claims). Singer (1978) also ingested "raw" specimens of this species. He reported no "psychotropic" effects whatsoever. 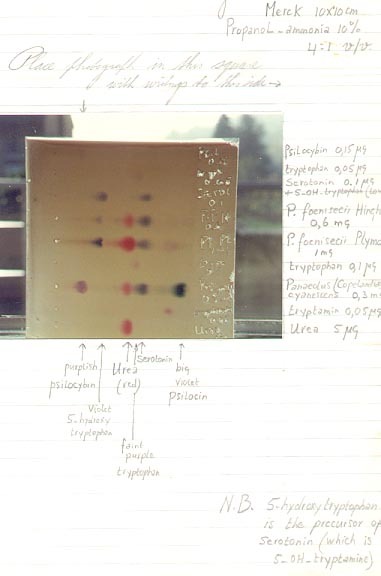 Subsequent chemical analysis of P. foenisecii by Singer (1991, Pers. Comm.) was negative. Arora (1979), believing this species to be harmless, stated that the " 'chemical analysis have revealed traces of psilocybin in certain strains, but [the] material I tested was inactive." Watling (1979) collected specimens of Panaeolina foenisecii in 1974 from Western Australia. He described the suspected poisoning of a two year old girl in Australia (the case originally reported by Southcott in 1974; see case history no. 3 above). Watling briefly mentioned Holden's (1965) report of an alleged poisoning of a three year old child in Great Britain, and argued that "because of its wide spread distribution, and its frequency on lawns and in parks P. foenisecii is likely to cause poisonings, especially in young children." Cooles (1980) reported that three teen-agers in the British Isles sought emergency treatment after each had allegedly consumed between 20 to 30 mushrooms. The mushrooms in this case were reported to be Panaeolina foenisecii; however, all three patients displayed symptoms of visual disturbances which included "euphoria and hallucinations of color and speed of movements such that lawns developed patches of brilliant colors and cars moved frighteningly fast." It is possible that these three young teen-agers may have consumed some specimens of Panaeolina foenisecii; but the symptoms described are similar to those associated with the ingestion of Psilocybe species (i.e., P. semilanceata (Fr. ex Secr.) Kumm., which is native to the British Isles, and P. cubensis (Earle) Singer, a commonly ingested psychoactive species which is not indigenous to these islands, but can be grown indoors clandestinely). In 1982, Beug and Bigwood published their analysis of two collections of Psathyrella foenisecii (syn, P. foenisecii) collected in 1978 from the Pacific Northwest. They reported the fungus specimens to be void of any psilocybin or psilocin. Christiansen, Rasmussen, and Holland (1984) analyzed Norwegian specimens of Panaeolina collected from a lawn in September of 1982 and detected no indole compounds. Stijve, Hischenhuber, and Ashley (1984) "...are of the opinion that P. foenisecii cannot contain psilocybin or psilocin at all." These scientists came to this conclusion after analyzing 16 different collections of P. foenisecii from 8 countries, including Australia, the United States and six in Europe. 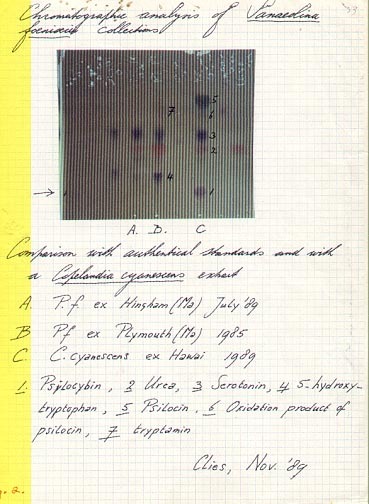 Specimens analyzed for possible indole compounds were collected over an eleven year period (1973-1982). Stijve, Hischenhuber, and Ashley also conducted controlled laboratory experiments with human volunteers to test the possible effects of P. foenisecii; however, "...even the equivalent of 40 gm of fresh mushrooms failed to produce any psychotropic effect." Gartz (1985) reported that his study and analysis of 100 specimens of P. foenisecii were psilocybin negative. More recently Ohenoja et al. (1987) detected psilocybin (0.03)% in two separate dried specimens collected in Finland. In 1977, Allen (1988a) collected a species of Panaeolina in Oxnard, California which macroscopically resembled P. foenisecii; later, Allen bioassayed this species and found that the mushrooms (40 fresh specimens weighing 52 gm) were definitely psychoactive. No voucher specimens were saved for examination. It is possible that the specimens collected in this case were misidentified by Allen and were actually Panaeolus castaneifolius (Murr.) Ola'h=Panaeolina castaneifolius (Murr.) Smith, or a similar related variety of Panaeolus. Allen (1988b) also reported that two elderly ladies were intoxicated by Panaeolina foenisecii in Portland, Oregon. According to a recent study by Young (1988) "...chromatographic analysis of Australian Material (Panaeolina foenisecii) has not yet demonstrated the presence of any psilocybin in this species." Based on his personal ingestion of the fungus, John Leonard (1989, Pers. Comm. ), a resident of Hingham, Massachusetts, claimed that Panaeolina foenisecii collected on his own front lawn was psychoactive in large quantity. Voucher specimens of Leonard's 1985 collection have been deposited at the Bishop Herbarium in Honolulu, Hawaii for scientific examination (1989. 363. Sheet # 580325. May-June 1985. Plymouth, Mass.). Two other collections of Leonard's specimens were forwarded to Dr. T. Stijve in Switzerland for study. Botanical identity was confirmed and chemical properties were established. Both collections of the fungi were analyzed by High Performance Liquid Chromatography and by High Performance Thin Layered Chromatography with identical results (see Fig. 2). Comparative analyses using specimens of Copelandia cyanescens from the Hawaiian Islands shows that both of Leonard's collections of Panaeolina foenisecii from Massachusetts contain characteristic compounds of Panaeolus species. These include urea, serotonin and its precursor 5-hydroxytryptophan. Although tryptophan might also present, there is definitely no psilocybin or psilocin, (i.e., 0.01% dry weight). Also the absence of bufotonin (5-hydroxy-N, N-dimethyltryptamine) suggests that the fungi is not able to methylate serotonin (Stijve et al., 1984). The results in figure 2 show the difference. 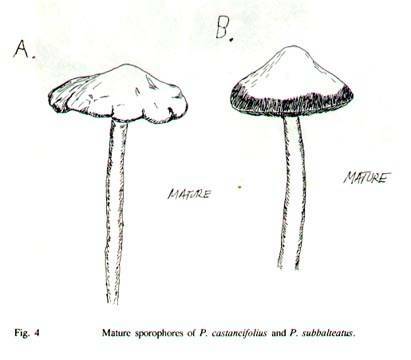 Recently a popular American publication devoted to the drug subculture featured a pictorial which described Panaeolina foenisecii as a common psychoactive fungi (Brolyn 1990). Although there is no recorded medical use of Panaeolina foenisecii in the literature, over the years one of the authors (JWA) has been informed by several people who have experimented with this fungi. According to some of these informants Panaeolina foenisecii does produce some symptoms of relaxation, including a tranquil feeling of well being. This may be caused by some of the various tryptamine alkaloids, including 5-hydroxytryptophan, which are known to occur in various species of mushrooms producing psilocybin and/or psilocin. Regarding the Australian case history described by Southcott (1974), it is curious that the young girl's mother would allow her daughter to play in the garden alone (at such an early age), and given her pica propensity. Nevertheless, the specimens of Panaeolina foenisecii collected in the garden were later analyzed and found to contain no hallucinogenic properties. While the reported symptoms and duration of effects are similar to those produced by psilocybin, it must be noted that the onset of the mind-altering effects of psilocybin normally occur within 15-30 minutes after ingestion. According to Southcott and the child's mother, the child's symptoms always seemed to occur between 6 to 8 hours after being allowed to play outdoors, or upon waking up after taking a nap. Southcott also mentioned that this child was having some minor psychological difficulties with her mother and this may have added to her symptoms. It is also possible in this case that the child may have eaten other psychoactive plants and/or fungi from the garden than Panaeolina foenisecii. However, there is no evidence that the child actually ingested such substances, and no other species of fungi were observed in the garden of the child's home. Both Southcott (1989, Pers. Comm.) and the technical services of the Botanic Garden of Adelaide surveyed this garden for other species, including possible toxic plants, on more than one occasion. Southcott thus claims that no other known hallucinogenic plants were present in the yard. The child still lives with her parents at the same address in Adelaide and, now (aged 19) many years later, she appears to be quite normal for her age, and is presently employed. Although as a child, according to the mother, she did not initially admit to eating the fungi, later on she did acknowledge her ingestion of mushrooms. This admission, however, must be regarded with caution, and may have resulted from both repeated queries by the doctors and the mother (the child was put under pressure by being sent to the Children's Hospital for blood tests, i.e. 'pricks in the thumb'). Southcott (1989, Pers. Comm.) stated that "...when told that fungus eating would result in 'thumb pricks', the child at about age four, saw the light" and both the 'thumb pricks' and hallucinatory attacks terminated. Whether or not Panaeolina foenisecii is psychoactive is unclear, but because of the above mentioned incidents, it is reported by some mycologists as dangerous to young children. For example, Smith and Weber (1980), who referred to this species as Psathyrella foenisecii, claimed that: "...the danger for toddlers is that parents may not be sure which species the child ate, since many lawn fungi fruit along with Psathyrella." Although Smith and Weber also noted the possible edibility of this fungus, they did not recommend ingestion: "Some populations may contain psilocybin and psilocin. It is one of the lawn species that toddlers find and eat when they are in the grazing stage. The danger to the child lies in the fact that we have 400-plus species [Psathyrella] of this genus in North America, and we know little of their chemistry. At least one case of serious poisoning in a child [cf. Southcott 1974], has been linked to this or a closely related species." Orr and Orr (1979) also referred to the dangers this species might present to little children: "This very common little mushroom is frequently eaten by children who find it when they play, and this can be of concern because it contains small amounts of the psychotropic substances psilocybin and psilocin." However, if this species contains only a minute amount of psychoactive compounds, it would not cause the symptoms described by Holden (1965), Miller (1972), or Southcott (1974). In recent years, a number of mycologists have listed this species as being poisonous/hallucinogenic, probably basing their assumption on information provided by the above mentioned research. After re-examining past research and the additional evidence described above, it is our conclusion, as well as that of Gartz (1985), Guzman (1989), Stijve (1989), Watling (1989), Young (1989) and Singer (1991, Pers. Comm. ), that Panaeolina foenisecii is not psychoactive. The authors of this study would recommend controlled studies of cultivated Panaeolina foenisecii in which precursor(s) known to affect production of psilocybin and/or psilocin in proven producers of the indoles would be supplied to the organism. Controlled studies have demonstrated that these indoles are secondary metabolites which may not occur in collections lacking specific nutrients and which occur in larger quantities if proper precursors are provided. The authors wish to thank Dr. R. V. Southcott for allowing us to reprint an edited version of his case history from Adelaide, Australia. We also are grateful to Margaret Holden of Halperden, England and Dr. 0. K. Miller, Professor of Botany and Curator of Fungi at the Virginia Polytechnic Institute and State University for their contributions to this paper. Appreciation is also extended to Mr. Alan R. Outen, England, for his photograph of Panaeolina foenisecii and Mr. Robert Hathaway of Honolulu for his illustrations in Figures la, 3, and 4. We would also like to express our special gratitude to Dr. Richard Evans Schultes for reviewing our paper and to Dr. Roy Watling of the Royal Botanic Gardens, Glasgow, Scotland and Dr. Tony Young of Blackbutt, Australia for their valuable contributions in the preparation of this paper. In addition, we thank Mr. John Leonard of Hingham, Massachusetts for his collections of Panaeolina foenisecii. Finally, we need to recognize the technical assistance and significant support of Dr. T. Stijve of Nestec LTD, Vevey, Switzerland for his botanical and chemical analysis of Panaeolina foenisecii. Allen, John W. 1988a. Latent Psilocybian Species of Panaeolus. In: Spring Time Magic: A History of Psychoactive Mushrooms, Past and Present Applications, with Special Attention Given to Panaeolus Species. Chapter 20. (Unpublished Manuscript). ------. 1988b. Accidental Ingestions of the Panaeolus Kind. In: Spring Time Magic: A History of Psychoactive Mushrooms, Past and Present Applications, with Special Attention Given to Panaeolus Species. Chapter 36. (Unpublished Manuscript). Allen, J. W., Mark Merlin and Karl Jansen. 1991. An Ethnomycological Review of Psychoactive Agarics in Australia and New Zealand. Journal of Psychoactive Druqs Jan-Mar 1991. Arora, David. 1979. Mushrooms Demystified. 10 Speed Press. Berkeley, Ca. Bassette, Alan and Walter J. Sundbery. 1987. Mushrooms and a Quick Reference Guide to Mushrooms of North America. Macmillan Field Guides. Macmillan Publ. Co. N.Y.
Beug, Michael W., and Jeremy Bigwood. 1982. Psilocybin and Psilocin Levels in 20 Species from Seven Genera of Wild Mushrooms in the Pacific Northwest. Journal of Ethnopharmacology Vol. 5(3):271-285. (see page 285). Bigalow, Howard E. 1974. Mushroom Pocket and Field Guide. Macmillan Pub. Co. Inc. N.Y. & Collier Macmillan Publ. London. Brolyn (Pseude.) 1990. Magic Mushrooms on Your Front Lawn. America's Harvest Mushroom. Hiqh Times Vol. 178: 40-41, 55-56, 59, 65-66. Christiansen, A.L., K.E. Rasmussen, and K. Holland. 1984. Detection of Psilocybin and Psilocin in Norwegian Species of Pluteus and Conocybe. Planta Medica Vol. 50(4):341-343. (Vol. 51 on cover) . Cleland, J.B. 1934. Toadstools and Mushrooms and Other Larger Fungi of South Australia:l9. Adelaide, Australia. Cooles, Philip. 1980. Abuse of the Mushroom Panaeolus foenisecii. British Medical Journal Vol. 280 (6212):446. Feb. 16.
Cooper, R. 1980. A Guide to British Psilocybin Mushrooms. Red Shift Books. Dillcourt Ltd., London. Courtenay, Booth and Harold H. Burdsall, Jr. 1982. A Field Guide to Mushrooms and Their Relatives. Van Nostrand Reinhold Co. N.Y.
Dickenson, Colin., and John Lukas. 1983. (Eds). The Encyclopedia of Mushrooms. G. P. Putnam & Sons. New York. Enos, Leonard. 1972. A Key to the North American Psilocybin Mushroom. a Youniverse Production. Lemmon Grove, Ca. Fiusello, N., and J. Ceruti-Scurti. 1972. Indross-Indol Derivati Basidiomiceti 2.-Psilocibina, Psilocina le 5-Indrossi-Indol Derivati in Carpofori di Panaeolus e Generi Affini. Allionia Vol. 18:85-90. Gartz, Jochem. 1985. Zum Nachweis der Inhaltssoffe einer Pilzart der Gattung Panaeolus. Pharmazie 40:431-432. Glick, Phyllis G. 1979. The Mushroom Trail Guide. Holt, Rinehart & Winston. N.Y.
Guzman, Gaston. 1989. Personal Communication. Guzman, Gaston., Jonathan Ott, Jerry Boydston, and Steven H. Pollock. 1976. Psychotropic Mycoflora of Washington, Idaho, Oregon, California, and British Columbia. Mycoloqia Vol. 68 (6):1267-1271. Haard, Richard., and Karen Haard. 1975. Poisonous and Hallucingenic Mushrooms. Cloudburst Press. Brackendale. 2nd edition, Homestead Book Co., Seattle, Washington. Holden, M. 1965. A Possible Case of Poisoning by Panaeolina foenisecii. Bull. Brit. Mvcol. Soc. Vol. 25:9-10. Kibby, Geoffrey. 1979. Mushrooms and Toadstools A Field Guide. Oxford, N.Y., Toronto, Melbourne, Oxford University Press. Kreiger, Louis. 1936. The Mushroom Handbook. (see 1967 ed.). Dover Publ., N.Y.
Leonard, John. 1989. Personal Communication. McKinny, Margret and Daniel E. Stuntz. 1987. The New Savory Wild Mushroom. Rev. and Enl. by Joseph Ammirati. 3rd Ed. Seattle, London, University of Washington Press. Mcknight, Kent H and Vera B. Mcknight. 1987. A Field Guide to Mushrooms-North America. Houghton Mifflin Co. Boston. Mantle, P.G., and E.S. Waight. 1969. Occurrence of Psilocybin in the Sporophores of Psilocybe semilanceata. Trans. Brit. Mycol. Soc. Vol. 53 (2):302-303. Menser, Gary. 1977. Hallucinogenic and Poisonous Mushroom Field Guide. (see pp:45-47). And/Or Press. Berkeley, Ca. Michael, E. 1919. Fuhrer Fur Pilzfreunde 3. Band, no. 257. Zwickau: Forster und Borries. Miller, 0.K. 1972. Mushrooms of North America. (see pp:176-177). Dutton. N. Y.
Ohenoja, E., J. Jokiranta, T. Makinen, A. Kaikkonen, and M.M. Airaksinen. 1987. The Occurrence of Psilocybin and Psilocin in Finnish Fungi. Journal of Natural Products (Lloydia) Vol. 50 (4):741-744. Ola'h, Gyorgy-Miklos. 1968a. Etude Chemiotaxonomique sur les Panaeolus. Recherches sur las Presence des Corps Indoliques Psychotropes dans cis Champignons. Como. Rendus Acad. Sci. Ser. D. *701. 267:1369-1372. ------. 1968b. Le Genre Panaeolus. Essai Taxonomique et Physiologique. Rev. Mycol. 1968 Edition. ------. 1969. Le Genre Panaeolus. Museum Nat. d'Hist. Nat. Paris. ------. 1970. Le Genre Panaeolus. Essai Taxonomique et Physiologique. Revue de Mycologique. Memoire Hors-Serie No. 10. Orr, Robert T., and Dorothy B. Orr. 1979. Mushrooms of Western North America. University of California Press. Berkeley. (see PP:l7O-171). Ott , Jonathan. 1974-1975. (Unpublished Field and Laboratory Notes). ------. 1976. Hallucinogenic Plants of North America. Wingbow Press. Berkeley, Ca. Ott, Jonathan., and Gaston Guzman. 1976. Detection of Psilocybin in Species of Psilocybe, Panaeolus, and Psathyrella. Lloydia Vol. 39 (4):258-260. July-Aug.
Pacioni, G. 1981. Les Champignons. Paris. Un Guide Nathan. Pollock, Steven H. 1976. Psilocybin Mycetismus with Special Reference to Panaeolus. Journal of Psychedelic Drugs Vol. 8 (1):43-57. Ricken, A. 1915. Die Blatteroilze, Tab. 66:256. Leipzig: T.G. Weigel. Robbers, J.E., Varro E. Tyler, and G.-M. Ola'h. 1969. Additional Evidence Supporting the Occurrence of Psilocybin in Panaeolina foenisecii. Lloydia Vol. 32 (3):339-400. Singer, Rolf. 1978. Hallucinogenic Mushrooms. In: Rumack and Salzman (Eds. ): Mushroom Poisoning: Diagnosis and Treatment. Chapter 12:201-214. CRC Press, Cleveland. Singer, Rolf, 1991. Personal Communication. Smith, Alexander H. The North American Species of Psathyrella. Memoirs NY Bot. Gard. Vol. 24:1-633. Smith, Alexander H., and Nancy Smith Weber. 1980. The Mushroom Hunter's Field Guide. University of Michigan Press. Southcott, R.V. 1974. Notes on Some Poisonings and Other Clinical Effects Following Ingestion of Australian Fungi. South Australian Clinics Vol. 6 (5):442-478. Stevens, Jule and Richard Gee (Pseud. Steve Jewell and Rich Guiterrez). 1977. How to Grow and Identify Psilocybe Mushrooms. Rain Magic, Seattle. Stijve, T. 1989. Personal Communication. Stijve, T., C. Hischenhuber, and D. AShley. 1984. Occurrence of 5-Hydroxylated Indole Derivatives in Panaeolina foenisecii (Fries) Kuehner from Various Origin. Zeitschr. Mykol. Vol. 50-361. Tyler, Varro E., and Alexander H. Smith. 1963. Protoalkaloids of Panaeolus Species. In 2. International Arbeitstaauna Biochemieyund Physioloaie der Alkaloid ,	(K. Mothes and H.B. Schoeter, Eds.). Akademie-Verlag, Berlin:45-54. Watling, Roy. 1979. Studies in Lacrymaria and Panaeolus. Notes from the Royal Botanic Garden Vol. 37:369-378. Watling, Roy. 1989. Personal Communication. Young, A. M. 1988. The Panaeoloideae of Australia. M.Sc. Thesis, University of Queensland. Young, A. M. 1989. Panaeoloideae (basidiomycete, fungi) of Australia. Journal of Systematic Botany Vol. 2:75-97. Young, A. M. 1989. Personal Communication. Fig. la. Panaeolina Foenisecii. a. Spores, b. Mature specimen, c. Gills, d. Sporophores. Fig. 2. Panaeolus castaneifolius. Young specimen. Fig. 3. 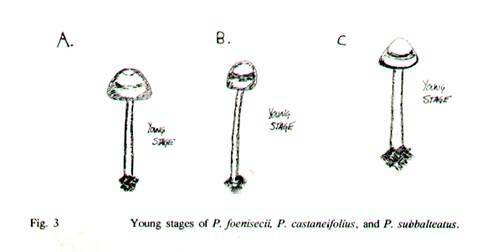 Young stages of P. foenisecii, P. castaneifolius, and P. subbalteatus. Fig. 4. Mature sporophores of P. castaneifolius and P. subbalteatus.